Image: Kerry Downey, Fishing with Angela (still), 2016. Performance and video. Courtesy the artist. Having met through the Queer Art Mentorship program, Angela Dufresne took Kerry Downey on a fishing trip upstate in Spring 2015. Downey’s subsequent performance and video explores the relationship between fishing and painting practices. They engage with the layered histories of mimicry through queer, feminist, pedagogical, painterly, and performative practices. Using an overhead projector, Downey attempts to copy Dufresne’s gestures, words, and ideas. The performance brings the politics and poetics of inter-generational exchange into close proximity. Having incorporated sound and instrumentation into her practice over the past two years, artist Sam Vernon collaborates with vocalist Abby Dobson on the occasion of the Queens International 2016. 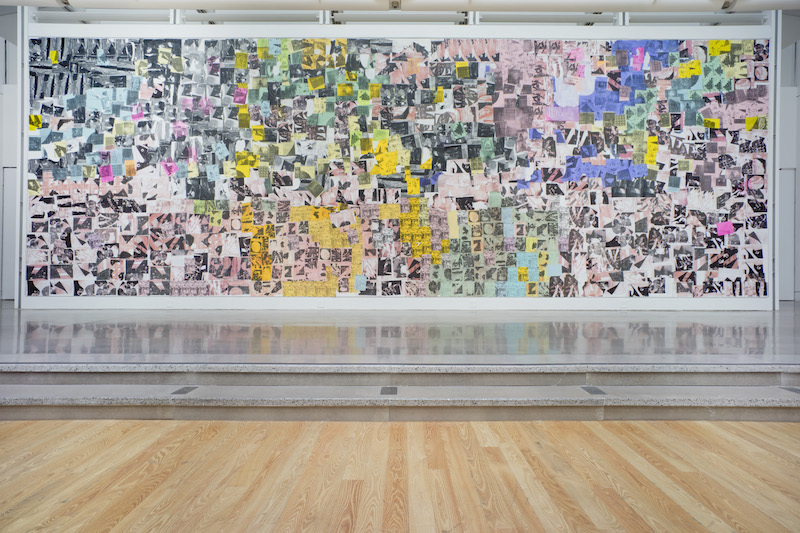 In response to Vernon’s installation Louis & Sam, currently on view in the Museum’s atrium, Dobson will interpret a selection of Louis Armstrong songs including “Nobody Knows the Trouble I’ve Seen,” “You’ll Never Walk Alone,” and “What A Wonderful World”. This audio collage runs parallel to Vernon’s visual work, which is inspired by the collage practice and improvisational genius of jazz legend, and Corona resident, Louis Armstrong. Inter-generational narratives, historical memory, and the collage-making of black experience inform both the visual work and performance. As part of Queens International 2016, Xiaoshi Vivian Vivian Qin presents a panel discussion occurring in the year 2116. The event takes Qin’s installation and video KZ as a point of departure, consisting of a glitchy, but still functioning, iPhone discovered 100 years in the future. The recovered device displays the phantom activity of the 2016 user, rapidly flipping through her calendar, maps, and videos. This iPhone-as-artifact will serve as the fictional prompt for the discussion, looking back on our current time from the speculated future. Image: Xiaoshi Vivian Vivian Qin, KZ (stills), 2016. Courtesy the artist.